We provide a 'Meet and Greet' service. Quick, safe and affordable private hire cars in Edinburgh. Book now and get a 20% discount*! At Capital Cars, we are proud to provide the most affordable and hassle-free service for private hire taxis in Edinburgh. From our easy booking system by phone, online or through our iPhone and Android apps and sending a car to your door quickly to offering you the best rates with a 20% discount* at the end of every journey, our highly experienced team will make sure you have to look no further than us every time you need a vehicle. 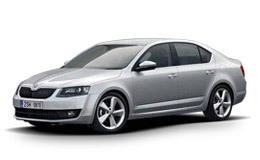 Our range of saloon cars for private hire includes safe models such as Skoda Octavia, Seat Toledo or Ford Mondeo that provide enough room in the boot for your personal luggage so that your journey is as comfortable as possible. Our fully licensed office in Edinburgh comprises a highly qualified team of friendly members that will process your order and send your cab to you within minutes any day, 24 hours a day. Book with us now and wait no longer for a great taxi in Edinburgh.